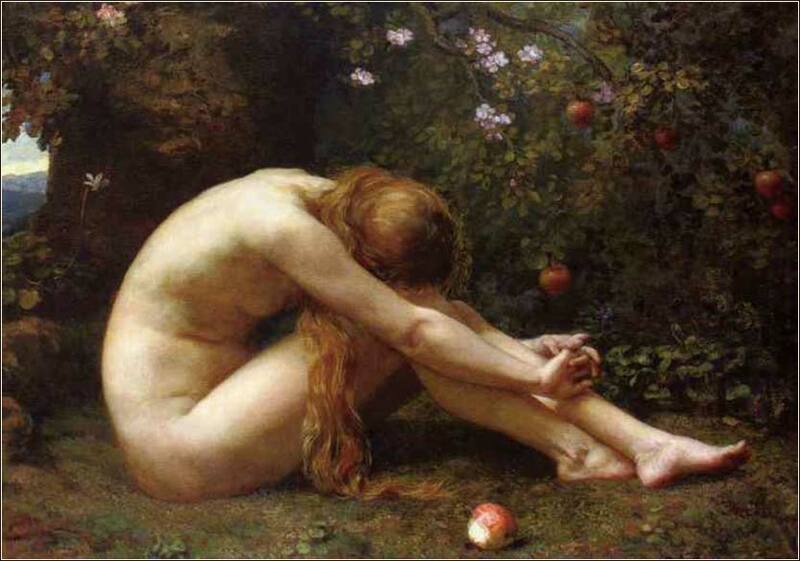 Eve by Anna Lea Merritt, ca. 1885. We've been waiting months for an excuse to use this wonderful study of Eve, as she realizes her guilt. 164 people in our community are currently praying with you. Now, to God the Father, who first loved us, and made us accepted in the Beloved; to God the Son, who loved us, and washed us from our sins in his own blood; to God the Holy Ghost, who sheddeth the love of God abroad in our hearts, be all love and all glory in time and to all eternity. 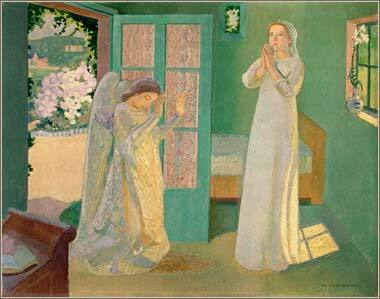 Annunciation by Maurice Denis, ca. 1898. Drink water from your own cistern and fresh water from your own well. Let them be yours alone and not for strangers with you. Let your fountain be blessed, and rejoice in the wife of your youth. As a loving hind and a graceful doe, let her breasts satisfy you at all times; Be intoxicated always with her love. For why should you, my son, be exhilarated with a strange woman and embrace the bosom of a foreigner? Solomon clung to these in love. He had 700 wives, who were princesses, and 300 concubines. And his wives turned away his heart. For when Solomon was old his wives turned away his heart after other gods, and his heart was not wholly true to the Lord his God, as was the heart of David his father. For Solomon went after Ashtoreth the goddess of the Sidonians, and after Milcom the abomination of the Ammonites. So Solomon did what was evil in the sight of the Lord and did not wholly follow the Lord, as David his father had done. Then Solomon built a high place for Chemosh the abomination of Moab, and for Molech the abomination of the Ammonites, on the mountain east of Jerusalem. Time and again God has told the Israelites not to intermarry with other tribes. This rule was given not to preserve racial or tribal purity — numbers of ethnic Egyptians had been allowed into the Exodus, for example — but as a safeguard against temptation to idolatry. We might see in this another type of sin: relying on worldly power rather than the Lord to accomplish His work. Solomon marries Pharaoh's daughter as a diplomatic move, not suggested or sanctioned by God (and forbidden by Mosaic law), to secure his southern flank. But reliance on oneself, rather than God, transgresses the concept of faith. We see self-reliance resulting in Hebrew defeat repeatedly; as with adultery, the lessons began before the Hebrews ever entered Canaan. See Numbers 13 and 14. Galatians 5:26 (J.B. Phillips NT): Let us not be ambitious for our own reputations, for that only means making each other jealous.